Thanks to Master Gardener and Horticultural Therapy Volunteer Linda Johnson, the Chadwick Horticultural Therapy Program has garnered state-wide attention. Linda nominated the program for recognition from the state Master Gardener association and it received two awards at the recent state conference. 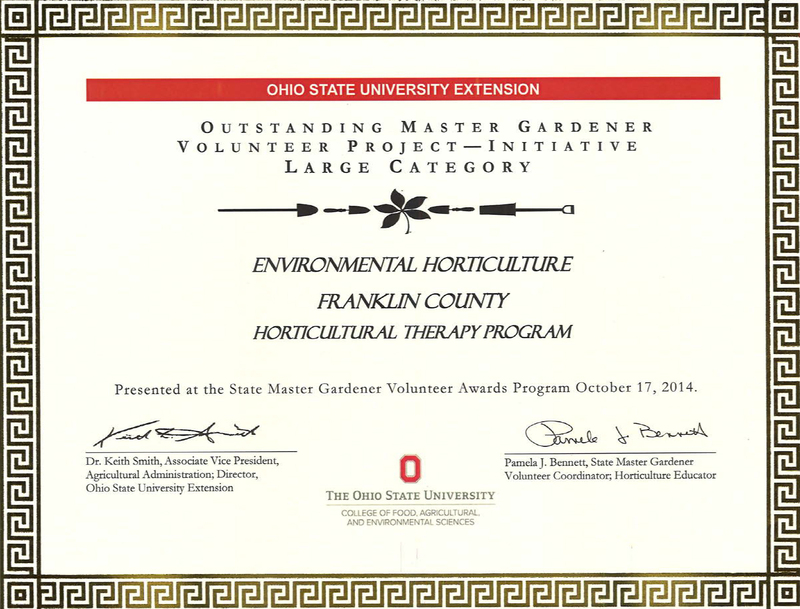 In competition with all Ohio counties having 75 or more Master Gardener volunteers, Horticultural Therapy was named the 2014 Environmental Initiative winner and the 2014 State Winner for Outstanding Master Gardener Volunteer Project. Enthusiasm from volunteers like Linda makes Horticultural Therapy a winning program.